74 Beekman St. N. Y. In 1887 the New York telephone directory listed Marcey [sic] Stove Repair Co. at 63, 65 Beekman St., Manhattan, with telephone number John 888. In 1889 Trow's New York City Directory listed Caesar, Denis & Hauser, "stove materials," at 63 Beekman St. The three partners in this business were Jacob Caesar, Otto Denis, and Arnold E. Hauser. The business name initially was Marcy Stove Repair Co., and later Marcy Foundry, and their offices were located at 74 Beekman St. from 1893 until 1938. 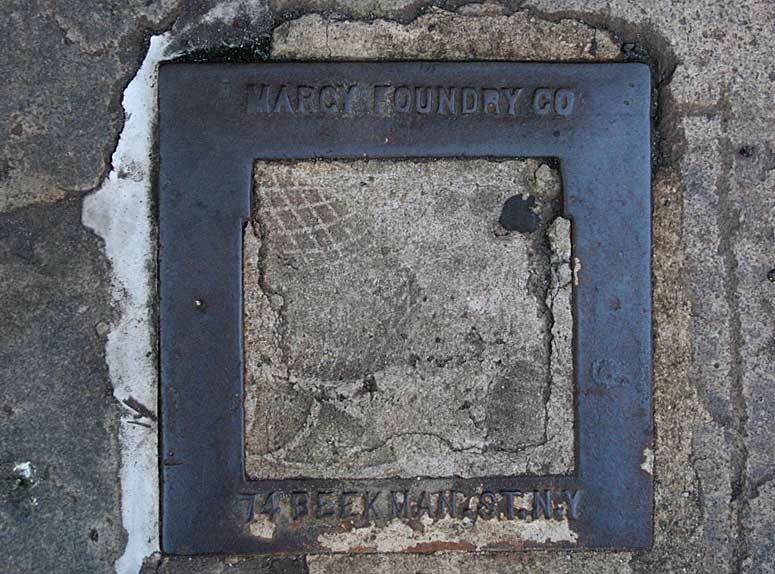 The sidewalks of New York City have hundreds of Marcy Foundry openings of exactly the type pictured above. Always of the same shape and size, some differ only in that later ones have the address Jersey City N J instead of 74 Beekman St. Marcy Foundry moved to 340 Grove St., Jersey City, N. J. in 1938, where they continued to be listed in New York telephone directories through 1951. This Marcy sidewalk opening without its inside cover seems to indicate these lids were designed to allow access to either water or gas shutoff valves. Otto Denis (1854-?) was listed as president of Marcy Foundry Co. in New York city directories from 1915 to 1918. He was recorded in the 1900 U. S. Census living at 434 Central Park West, Manhattan, when he was 45 years old. He lived with his wife, Sarah, and three daughters. He was also recorded in the 1910 U. S. Census and the 1915 New York State Census. In 1910 he lived at 434-438 W. 116th St., and in 1915 he lived at 39-41 Claremont Ave.
Arnold Emile Hauser (1857-?) is well documented in census reports. In 1900 he lived at 177 Penn St., Brooklyn, N. Y. He was 43 years old, born April, 1857, and his occupation was "manager, manufacturer, fire brick." His family included two daughters, Augusta, age 20, and Anna, age 16. In 1910 Hauser lived at 663 Ocean Ave., Brooklyn, and his daughters still lived with him, although Augusta was now "Augusta M. Gross" and Anna was "Anna Gross." The same names appeared with his listing in the 1915 New York State Census. Were both women his step-children? Around 1915 Anna Gross began being listed as an officer in Marcy Foundry and Marcy Stove Repair. Trow's 1919 Copartnership Directory listed Anna Gross and A. M. [Augusta] Gross as directors along with Arnold E. Hauser. From around this date Hauser with his "daughters" became sole proprietors of the foundry. In the 1933/34 Polk directory A. M. Gross was listed as A. M. Bartow. Probably she married a Bartow. But things get a bit complicated here. A story in the New York Times, 18 April 1935, refers to Mrs. Augusta Bartow as Hauser's half-sister. Arnold E. Hauser was awarded a patent for his Device for Transmitting Motion, 19 Sep. 1905. Another figure at Marcy was Frederick H. Jacobs (1891-?). He registered for the World War I draft in 1917 when he was "bookkeeper, Marcy Stove Repair, 74 Beekman St., Manhattan." The 1920 U. S. Census recorded him living at 125 Cooper St., Brooklyn, when his occupation was "Manager, Marcy Foundry Co." He was 39 years old and lived in Richmond Hill, Queens, in 1930. Polk 1933/34 listed him as secretary-treasurer of Marcy Foundry Co And the 1940 U. S. Census recorded him living at 91-31 111th St., Richmond Hill, Queens, age 39 and "office manager, stove repair." This Marcy ad appeared in The Metal Worker, 5 Feb. 1898. Virtually identical was this ad for Marcy from 1901. These indicate that Marcy's foundries were located in Perth Amboy, New Jersey. They also show that Marcy manufactured "fire-brick" from a factory in Brooklyn, and that they had a "branch store" on Grove St., Jersey City, N. J. This ad from much later, 1918, gives much the same information except the fire-brick factory is not mentioned.